One of my professors this semester seems to becoming increasingly frustrated with his students’ lack of participation. He is making all sorts of attempts to spark more discussion, but it just isn’t working out for him. “We’re all friends here. I hope you can see that by now,” he remarked last lecture. I appreciate his sentiment, but I have a hard time participating in classrooms, especially very large ones. It’s just a problem that I don’t think will easily go away. I do realize the importance of student participation, and wish instructors didn’t have such a hard time engaging students. Student participation is critical for the success of the instructor and the class, as a whole. We learn from our failures. Without feedback, the teacher cannot identify holes in the students’ understanding and consequently make clarifications. This is especially critical with material that is cumulative. In my three-year career at the Institute, I’ve witnessed countless instances in which an instructor has had a really difficult time engaging students. Sometimes professors go months before they realize there’s a real problem. I’ve heard arguments by professors that the blame for the lack of discussion should be placed on the students. This reasoning has some validity to it, but it lacks an emotional understanding of what it feels like to be an insecure student in a large classroom. Classrooms are naturally competitive environments, and asking questions can feel like showing a sign of weakness. It’s been drilled into us all that being incorrect is bad, and therefore no one wants to look stupid. As the designated leader for class, instructors should feel responsible for the success of the classroom and the students as a whole. It is not sufficient for just a few students to participate. Even though those students may be working hard, this fails to really give the instructor an indication of class’ understanding of the material. I have encountered this problem from the other side of the issue during my time as a teaching assistant. Along with another fellow TA, I was responsible for running a recitation every week for CS 1331. 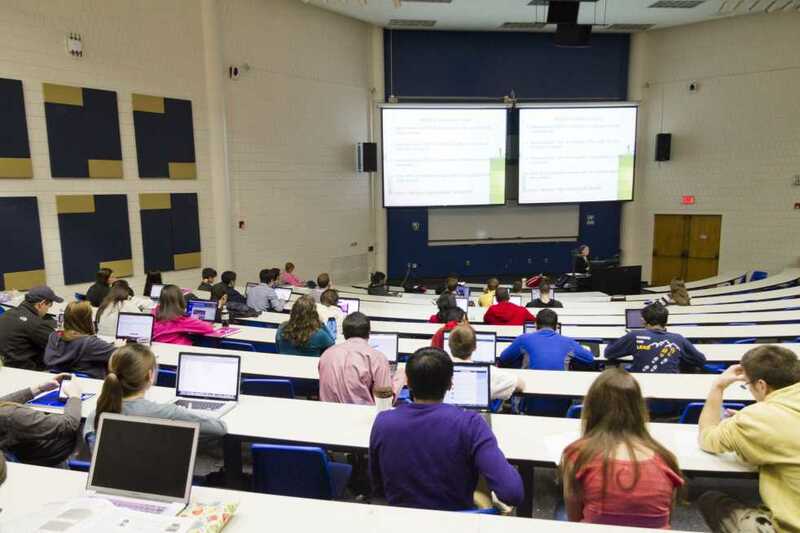 Even though recitation is primarily intended for clearing up any questions students may have from lecture, students were usually very reluctant to speak up. The problem isn’t isolated with my major-specific classes, but some classes have more of a problem than others. This is one of the major benefits of smaller classrooms—instructors know everybody by name and no student can get away without participating every day. In a perfect world, all of my classes would have fewer than 15 students enrolled. I was fortunate to have such a situation in the College of Computing study abroad program in Barcelona. Unfortunately, there’s no practical way of shrinking the size of every class to that magical number of students that results in active participation from everyone in the class. However, I do believe that there are other ways to fix the problem. All instructors should be constantly gauging the students’ success in some way or another. Begging students to respond to their questions is not the way to do it. Instead, instructors should be creative to figure out what methods inspire student discussion and collaboration work best. There have been a lot of recent developments that have tried solving the participation problem—clickers, OpenStudy, Piazza, TopHat etc. I’ve had classes that use these products, and I strongly believe that I got more out the class because of these products. However, the solution is not as simple as just registering a class for Piazza. In order to make these modes of participation valid, and ultimately useful, the instructors must actively participate as well. At the bare minimum, instructors must follow up class problems with correct answers and a detailed explanation. As class sizes are getting bigger, instructors are getting more disconnected with their students. Even though this is an important issue that professors should remedy in the short-term, I expect it to lead to valuable discussions and innovation that will change the classroom experience for the better.